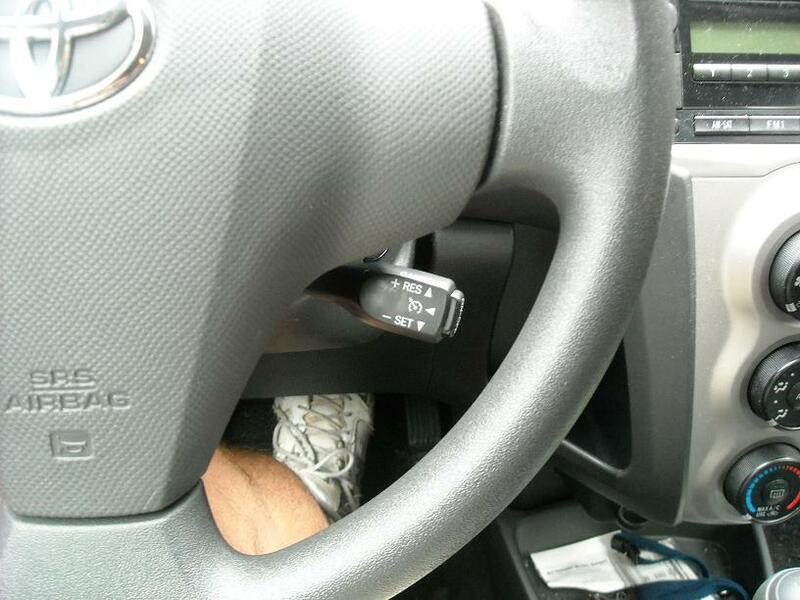 Successfully installed factory cruise control today in a 2009 Yaris 3 door base hatch. Just want to sum up and condense what I learned from the three or four other cruise control threads and my observations. 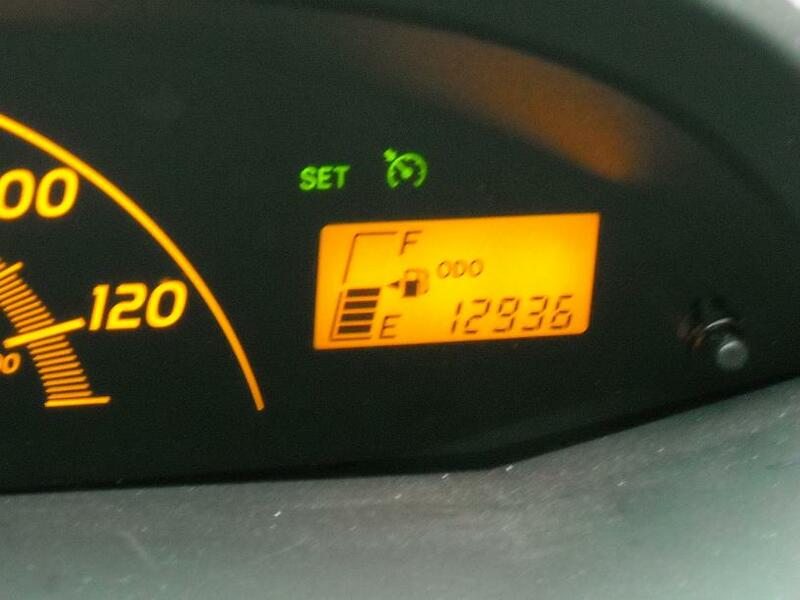 If your 2009 Yaris has the Power Package or is the S all the correct wiring is in place. If you have a base without the power package there may be more wiring needed that is not covered here. I know this package is more expensive then the aftermarket switches mentioned elsewhere or the Radio Shack specials which can be put together for 10 bucks but I like the stock look and think a dealer will never even notice you did this yourself if there is a warranty issue down the line. You only have to remove the airbag and drill one 1 inch hole for the auto, that and install the clutch switch for the stick. Piece of cake all around and its just 20 minutes start to finish if you have all the parts and tools assembled in advance. 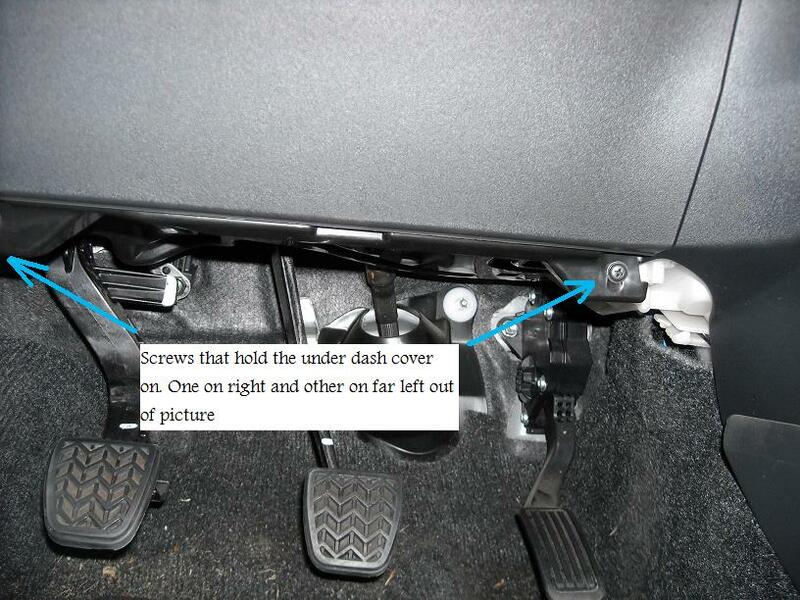 Use the 10 mm wrench to remove the negative terminal from the battery to disable the airbag. Wait at least 90 seconds before removing the airbag, better yet do the clutch switch first or go get a soda. Do the clutch switch if it’s a stick. There is an under dash cover that needs to be removed, remove the two philips screws on the bottom edge of the dash and just pop the cover down. Now get under the dash and look up at the driver’s side of the clutch lever and you'll see a bolt that stops the pedal when you let the clutch up. Get a feel for how much free play the bolt is adjusted to. Use the 14 mm wrench to break the lock nut and replace that bolt with the clutch switch making sure you duplicate the free play and snug down the switches lock bolt. Now look about 7 inches above the switch you just installed and you'll see the wiring harness for it taped up to another harness. Cut it down and plug it in and put the under dash cover back. Here are pics of the underdash cover and the clutch switch in place. Now remove the airbag. Use the #27 torx driver on the two nuts recessed on both sides of the steering wheel loosen them until the airbag assembly is loose, you don't have to completely remove them. SUPPORT the airbag you don't want to stress the wires going into the clock spring assembly. 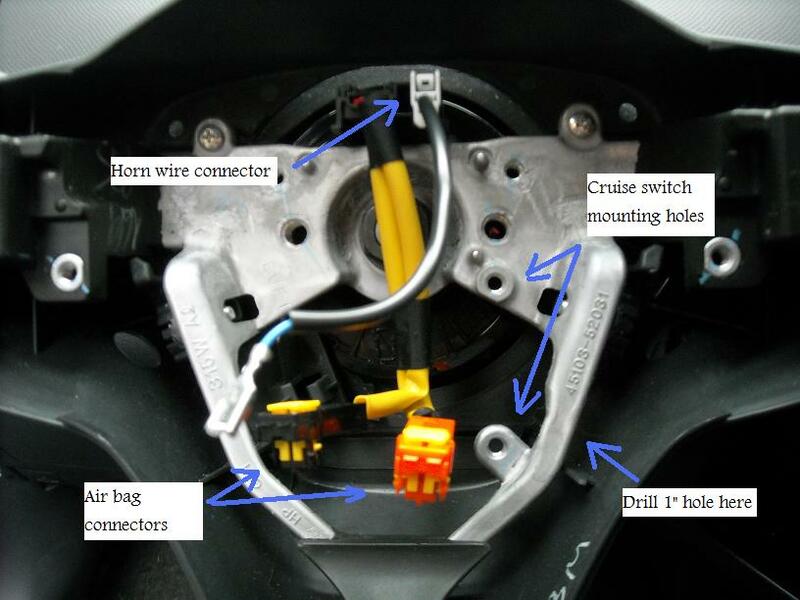 There are three wires to remove, the horn wire and the two airbag wires. The horn wire is a spade connector - just pull it off the airbag. 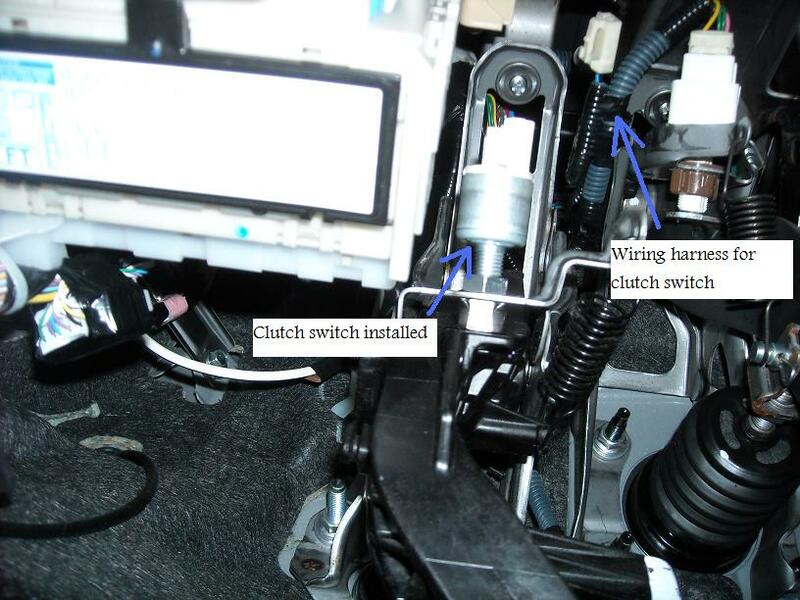 The airbag wires require you to first use a small flat blade screwdriver to work up the yellow clip on top of the connector when that is done then use the screwdriver under the connector to work the connector up out of the airbag. Put the airbag someplace safe out of the sun. Now remove the horn wire from the clock spring by just pressing lightly on the tab on top and pull the wire out. Use some masking tape and secure the airbag wires aside so you don't damage them or the clock spring. Drill the 1" hole for the switch. I just matched the switch up to the screw holes, estimated the spot then carefully drilled from the outside in. Put the switch through the hole and see if you lined up right, remember the switch is supposed to move up down and forward. Enlarge the hole as necessary to make up for alignment errors using a sharp knife then screw the switch in place. Pics of the cruise control switch mounted. Put your new cruise control switch wire in the connector on the clock spring you took the horn wire out of and plug it into the cruise switch. Reinstall the airbag reversing the method you used to take the connectors off. There is a lot of advice out there to keep yourself grounded while you handle the airbag, you can do this by just touching the bare metal in the steering wheel assembly its grounded. Tighten the two #27 torx bolts on either side of the wheel, reconnect the battery and you're done! Nice write-up/ install pictures ! Kinda makes me what to install this modd along with some power windows lol . I took the easy way out and wired up my own buttons on an empty panel. It took longer to solder up the buttons than it did to wire everything. Well my way was alot easier I think but it was far more expensive. Do you have the p/n for the column cover, should I not want to go drilling in to my existing piece? Thanks, killer write up. If you don't have the power package, what additional wiring is required? Anyone have the cover p/n? Yes, look at post #10 above for the Toyota part number. 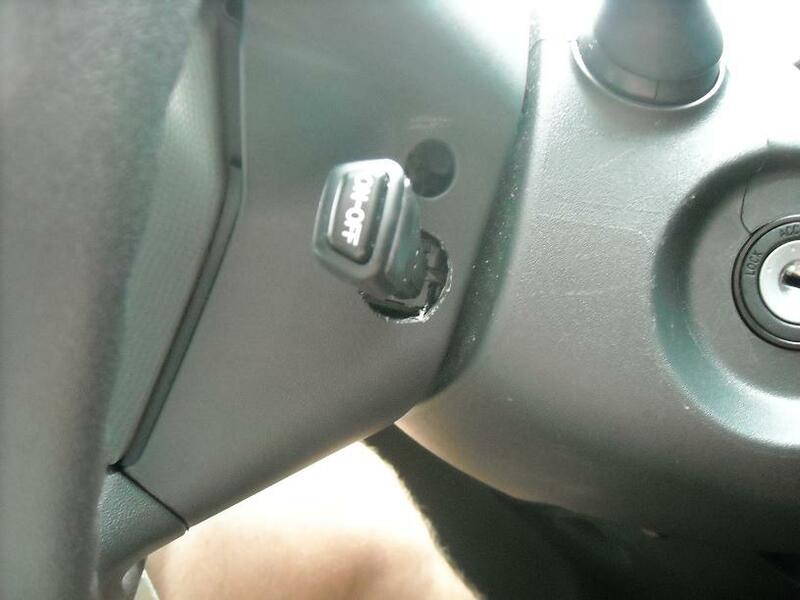 I would just like to add, Disconnect your battery before you mess with your airbag. So, this works automatically once you hook this all up!?! Is the Euro Yaris prepared for a factory cruise control and will it work?